Get cleaner air with advanced Donaldson Torit replacement cartridge, bag, and panel filters. Our Ultra-Web nanofiber replacement cartridge filters and Dura-Life “twice-the-life” replacement bag filters are engineered with proprietary, higher performance industrial air filter media that improves efficiency, saves energy and extends cartridge filter and bag filter life. Our Ultra-Web cartridge filters and Dura-Life bag filters are the “Cure for the Common Collector”, and they are available for Donaldson Torit AND most other popular brands of dust collectors. Simply tell us the brand and model of your collector and we’ll supply you high performance industrial air filters from our large, in-stock inventory. 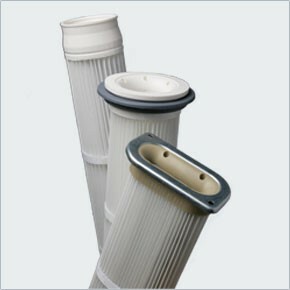 The distinguishing factor in Donaldson Torit cartridge filters is our patented Ultra-Web® nanofiber air filter media. Our nanofiber cartridge filter technology has been proven in the field for more than 20 years to have an advantage in cleaner air, higher efficiency, lower pressure drop, greater cost savings, and longer filter life than competitors’ filters. Nanofiber air filter media technology is available in all Ultra-Web and Fibra-Web cartridge filters and is constructed on a variety of base substrate air fitler medias. Ultra-Web nanofiber cartridge filters are shipped with all Donaldson Torit cartridge collectors and they are available as replacement cartridge filters for most other popular brands of cartridge collectors. With hundreds of varieties to choose from, Donaldson Torit offers the broadest selection of cartridge filters for a wide range of industrial air filtration applications. Rely on Donaldson Torit to help you choose the best industrial air filters for your applications. Donaldson Torit continually raises the bar in bag filter technology. Providing the widest range of bag filters for any baghouse collector, Donaldson Torit now offers Dura-Life™ bags – the biggest revolution in industrial air filters for baghouse dust collection ever. Dura-Life bag filter technology is standard in all Donaldson Torit baghouse collectors and is available for all other brands of baghouses. This unique industrial air filter media technology traps dust on the surface of the bag filter, allowing dust to be easily pulsed off during cleaning, which results in lower pressure drop and annual energy savings. Dura-Life bag filters deliver the best value to your bottom line. Calculate your energy saving & downtime cost immediately using the Dura-Life Bag Filter Savings Calculator. We also offer envelope style bag filters for Dalamatic and Unimaster collectors and EZ Filter Packs™ for our cabinet collectors. From standard polyester to specialty bags to Dura-Life high performance bag filters, no one can match Donaldson Torit’s breadth and expertise in industrial air filters. For the best bag filters that keep any brand of bag style collector operating at its peak, rely on Donaldson Torit. For more than two decades, Donaldson Torit has advanced the proven and proprietary Ultra-Web® technology. Made with an electrospinning process that produces a very fine, continuous fiber of 0.2-0.3 micron in diameter, Ultra-Web nanofibers form a permanent web-like net with very fine interfiber spaces that trap dust on the surface of the media. Combining superior Ultra-Web technology with a sturdy spunbond polyester substrate, the Ultra-Web SB pleated bag filters deliver longer filter life, higher efficiency, and greater cost savings for baghouse collectors. Donaldson Torit also offers an oval configuration to the Torit pleated filter bag program that allows Donaldson to put its nanofiber technology into all popular makes and models of baghouse collectors. The Donaldson Torit HEPA and 95% DOP industrial air panel filters are used as primary filters in less severe applications or as afterfilters for heavy dust, fume, and mist collection. HEPA filters provide high filtration efficiency of 99.97% on 0.3 microns particles and 95% on 0.3 micron particles for DOP panel filter. Both of these panel filters come in a variety of sizes and airflows capacities to meet specific application requirements. Laboratory test show that Donaldson Torit panel filters last longer than competitor filters, in some cases, up to 35% longer. That longer life means greater cost savings over the effective life of the collector.